The Jubilee Greenway is part of the Inspire programme, run by the London Organising Committee of the 2012 Summer Olympics and 2012 Summer Paralympics. The Jubilee Walkway Trust are working with relevant authorities leading up to 2012 to improve accessibility, enhance continuity, provide resting places and improve the safety and quality of the Jubilee Greenway. 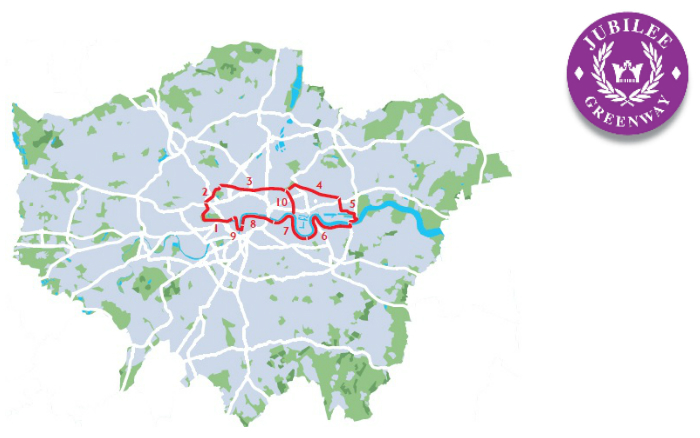 The Jubilee Greenway makes use of existing walking and cycling routes wherever possible beginning at Buckingham Palace and joining Green Park, Hyde Park and Kensington Gardens Royal Parks with Paddington Station and the Grand Union Canal at Little Venice. Following the Regents Canal through Camden The Greenway then connects to East London through Victoria Park to the River Thames where the Woolwich Foot Tunnel ties Greenwich and the South Bank to the Jubilee Walkway at Tower Bridge and back to St James’ via Westminster.